The Tibetan chorten corresponds to the Indian stupa, the reliquary in which the remains of the Buddha were preserved . The stupa represents the transition from the physical body to the immaterial, for the physical remains were revered to recall not only the bodily but the spiritual presence of the Buddha and his teachings. Already in India many different forms of stupas were constructed over the centuries, always with a tiered base, a hemisphere (anda) surmounted by a stepped rectangle (harmika), and a tapering spire of umbrellas. In Tibet monumental and miniature chorten were used to contain the ashes and relics of lamas and holy people . The so-called Kadampa chorten is said to have been introduced to Tibet by the Indian pandita Atisha (982-1054): the Kadampa school of Buddhism founded by his disciples has lent its name to this form of chorten. In that Atisha came from Vikramasila monastery in Bihar, this shape of stupa would seem to reflect the eleventh-century Pala style. 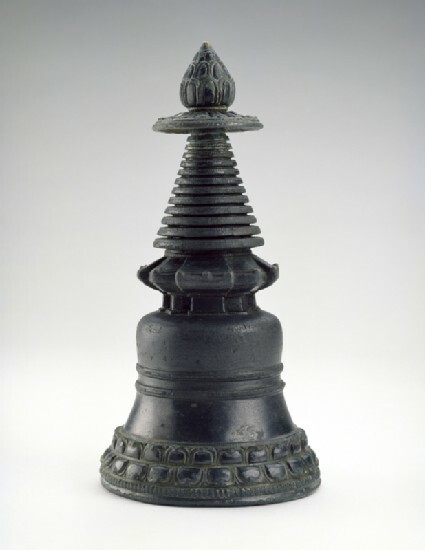 Although no documented metal stupas from north-eastern India are identical to the Kadampa chorten, on stone sculptures one finds stupas which share several elements, such as the bell-shaped anda, cruciform harmika, and conical spire . The Kadampa chorten have the double-tier lotus petal bases with beaded edge which characterize Pala sculptures of this period (see Manjusri and Yamantaka, cat. 45/46, and the silver chorten, cat. 60). The pedestal has beading at the bottom and sometimes at the top, and two rows of non-aligned lotus petals which are double, with an upturned tip. The Kadampa chorten consistently have the same canon of proportions and feature notably the bell-shaped anda with a pair of raised rings at mid-height, the conical spire modelled as tiered discs, each with beaded decoration on the upper surface, an umbrella decorated with elongated lotus petals on the upper surface, and a lotus bud finial with pointed tip. There are no inscriptions on this chorten. The base plate appears to be a later replacement as it is not consecrated, and it is no longer sealed but retained in place internally. The chorten is very heavy and presumably still has its contents intact. Such chorten were frequently installed on the altars of many Tibetan monasteries from Ladakh to eastern Tibet. A more precise provenance and chronology cannot be determined without opening this chorten . 1 The Tibetan term chorten (mchod rten) means literally 'the support (rten) of offering (mchod)'. 2 See Hatt, 'A Thirteenth-century Tibetan Reliquary: An Iconographic and Physical Analysis', for radiocarbon analysis of the contents of a Kadampa chorten which included manuscripts, grains, drawings, cloths, and tsa tsa; subsequently acquired by the Newark Museum: Reynolds et al., Catalogue of the Newark Museum Tibetan Collection, vol. 3, pp. 70-3. 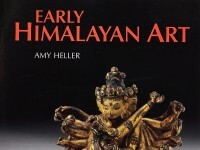 3 See Casey, ed., Medieval Sculpture from Eastern India, pls. 22-3, 33, all 10th-11th-century stone sculptures from north-eastern India which have similar-shaped stupas in the prabha. 4 It is said to have been collected by a member of the 1904 Younghusband Expedition to Tibet, although such reports are difficult to verify. Presented by Bernard McAvoy, 1997.